I'm really losing the will to live and hope somebody can help me. I want to trigger a 'free shipping' rule based on a product field value, but for the life of me can not expose the free shipping field to rules. I have read about bringing items into scope and have created a component which has access to the field. But when I attempt to add the component as a condition of my rule I am prompted to enter data selector - none of which seem to lead anywhere. I think it was wanting a product ID, which does not make any sense to me. I eventually managed to get this working by dropping the idea of having custom fields and replacing them with taxonomy terms. For whatever reason (probably inexperience) I could not expose my custom fields to the rules module in order to trigger the shipping rules that I wanted. I used flat rate shipping module and created a flat rate called free shipping price 0. Then I edited the component to only apply to the circumstances required and it works really well. FWIW I used flat rate for free shipping and commerce weight tariff for the rest which works ace for me. Not the answer you're looking for? 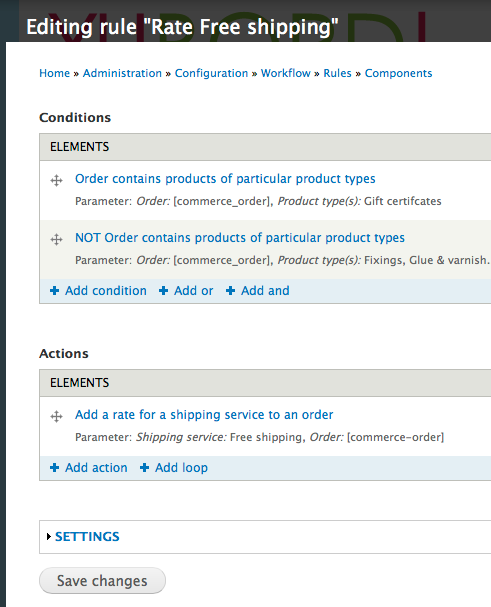 Browse other questions tagged 7 drupal-commerce or ask your own question. How to use Rules to add custom shipping cost per product? Discount based on a field in product display node in Drupal Commerce? How to use Rules to set a value for a multi-value field? How to remove shipping service with rules?